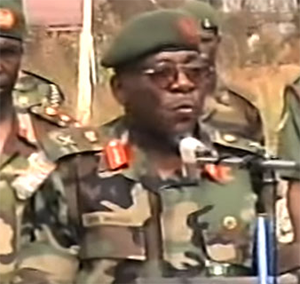 The remains of a former Chief of Army Staff, Lt. Gen. Victor Malu, was buried at about 12.23pm on Saturday in his hometown, Tongov, in the Katsina-Ala Local Government Area of Benue State. The late general, who was COAS between 1999 and 2001, died on October 9 in Cairo, Egypt, after a protracted illness. The News Agency of Nigeria reports that the Benue State Governor, Samuel Ortom, at the event, promised that the state would immortalise the late general after due consultation with the State House of Assembly. The governor described the late Malu as a professional soldier and a great man, who had done much to impact positively on the lives of the Tiv people of the state. The Chief of Army Staff, Lt.-Gen. Tukur Buratai, described Malu as an articulate, dedicated, forthright gentleman, professional officer, who was firm but calm. Buratai said his death was a great loss to his family, the army, the nation and the West African sub-region. The Chairman, Senate Committee on Defence, Senator Jeremiah Useni, described the late Malu as a great, efficient, brave and frank officer.